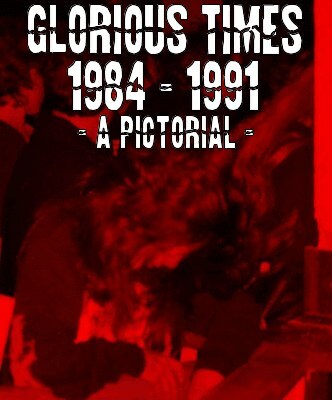 Alan Moses from Glorious Times (A Pictorial of the Death Metal Scene 1984-1991) has announced that less than 40 copies of their book remain for purchase. A collaboration between zine enthusiasts Alan Moses (Buttface zine) and Brian Pattison (Chainsaw Abortions zine), this relic features rare photographs and stories from the bands themselves. There are no outside influences to censor or alter what is displayed. Acheron – Autopsy – Baphomet – Brutality – Cannibal Corpse – Cryptic Slaughter – Dark Angel – Deceased – Deicide – Derketa – Disharmonic Orchestra – Exmortis – Groovy Aardvark – Hellwitch – Hideous Mangleus – Immolation – Impetigo – Incantation – Incubus – Insanity – Lethal Aggression – Malevolent Creation – Massacre – Massappeal – Master – Morbid Angel – Napalm Death – Nocturnus – Nuclear Death – Overthrow – Paineater – Possessed – Prime Evil – Revenant – Righteous Pigs – Ripping Corpse – Sacrifice – Sepultura – Slaughter – Soothsayer – Terrorain – Tirant Sin – Unseen Terror – Vomit – Wehrmacht – Where’s The Pope? The rumor mill has been pirouetting around Glorious Times, and there was a leak that a new book “Glorious Times 2” is in the works. Information for purchasing the remaining copies is located at their blogspot page.